Egypt On Edge: Friday Protests Turn Deadly : The Two-Way The Muslim Brotherhood calls for a "day of rage." The army moves to respond and violent clashes result in at least eight deaths as the repercussions of President Mohammed Morsi's ouster continue to be felt. Supporters of the Muslim Brotherhood hold a picture of deposed President Mohammed Morsi during a rally outside Cairo's Rabaa al-Adawiya mosque on Friday. After ousted Egyptian President Mohammed Morsi's supporters in the Muslim Brotherhood called for mass protests Friday, there were reports of violence in the streets of Cairo and some other cities. As The Associated Press writes, "some former militant extremists [had] vowed to fight." NPR's Soraya Sarhaddi Nelson, who is in Cairo, tells our Newscast Desk that they planned to march through the city's streets in a "day of rage" to protest both the removal of the president and the reported arrest of key Brotherhood leaders. 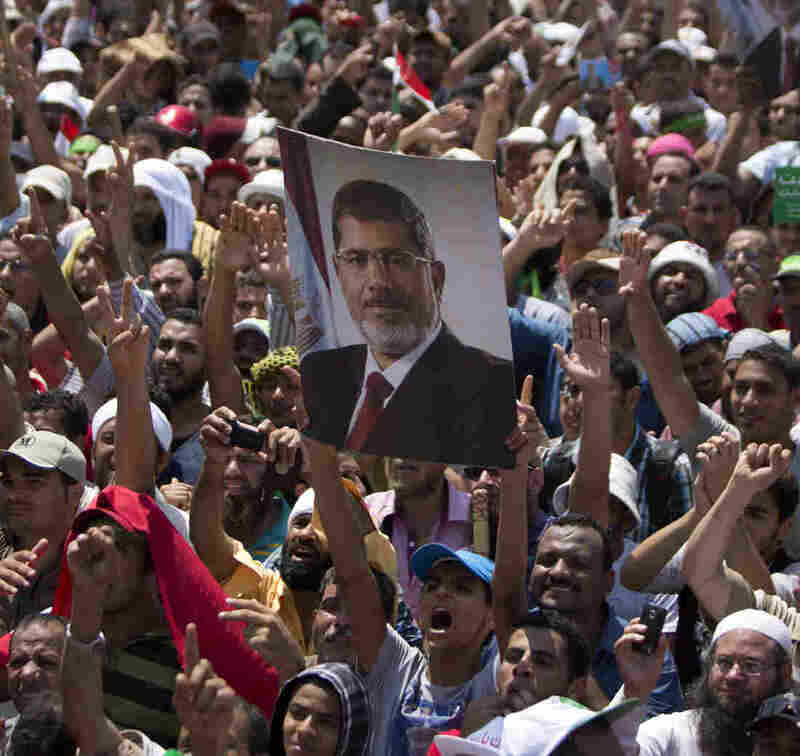 Authorities accuse them of inciting violence in the days leading up to Morsi's removal. By nighttime in Cairo, the military had deployed armored vehicles as clashes in the city escalated. The AP — citing Egypt's Health Ministry — reported that at least 10 people have died in violence across the country. The Guardian, which is among the news outlets live blogging events in Egypt, says the arrival of armored vehicles on the 6 October bridge in Cairo may have tamped down battles there between pro- and anti-Morsi groups. There was also word from State TV that the Islamist-led upper house of parliament had been dissolved. Al-Jazeera adds that "meanwhile, Egypt's military has appealed for conciliation and warned against unrest, as police rounded up senior Islamists." The army, as the BBC says, has pledged to allow "peaceful protests." Muslim Brotherhood leaders have said their followers will not resort to violence, but have also warned that things could quickly get out of control. We'll keep an eye on the news from Egypt and update as warranted. 4:20 p.m. ET. Mohamed Tawfik, Egypt's ambassador to the United States, tells NPR's Robert Siegel, that what has happened in his country is not a coup. Tawfik says the military's action is an expression of the people's will. "His actions was to gather as much power as possible in his own hands, to put members of his own organization in all the key positions in Egypt to be able to control all aspects of government, the media, the judiciary, the police, even religious organizations, in a way that would ensure that his group would remain in power for decades, irrespective of the democratic process. And that is what really scared the vast majority of Egyptians." "They have to acknowledge that they made mistakes. And they have to decide that they want to move move forward. Everybody in Egypt accepts that there must be a future for the Muslim Brotherhood within the democratic process. We want an inclusive process. And I strongly urge them to participate in that process. They're invited to do so." 3:27 p.m. ET. The AP now reports the Egyptian Health Ministry has raised the number of dead in clashes today to 10 people, with 210 injured. 3:15 p.m. ET. Egyptian Health Ministry is now saying that six people have died in clashes around the country. The AP quotes Ministry official Khaled el-Khatib saying that four people have been killed in Cairo and two elsewhere, with 180 wounded. The deaths and injuries occurred in a series of nationwide confrontations between opponents and backers of ousted President Mohammed Morsi, as well as security forces. "A large group of Morsi supporters are crossing the 6 October bridge towards Tahrir square, which is filled with people who opposed Morsi's presidency," the Guardian says. Images of the stream of people have also been airing on al-Jazeera. In a surprise appearance because it had been reported Thursday that he was under arrest, the Muslim Brotherhood's supreme leader, Mohammed Badie, just appeared at a pro-Morsi rally in Cairo. According to the Guardian, he told those gathered that "we will sacrifice ourselves, our souls and our blood, for President Morsi." Badie also said "we will stay in public squares until we free our elected president and we carry him on our shoulders." Badie called reports of his arrest "a lie." One eyewitness says he saw security forces shoot at pro-Morsi supporter who was trying to put a picture of the ousted president up on a gate outside Republican Guard headquarters in Cairo. According to NPR's Leila Fadel, the eyewitness says a guard had ripped the photo down — then the pro-Morsi supporter was shot as he tried to put the photo back up. Other guards then started firing in the air. The BBC's Jerry Bowen, who was at the scene and says he was injured by what appear to be shotgun pellets, reports he "saw soldiers fire on the protesters. He describes the location as "outside the officers' club of the Presidential Guard, where Mr. Morsi is believed to be held." "There have been clashes outside the capital as well. A BBC reporter says soldiers in Qina, in the south, opened fire on pro-Morsi protesters trying to storm a security building. At least two people were injured. Shots have also been fired in Alexandria in the north, Egypt's second-largest city." Egyptian state TV says that interim President Adly Mansour has issued a decree dissolving the Islamist-led upper house of parliament, other news oulets including Reuters are reporting. There's also word that Mansour has named a new head of intelligence. A spokesman for the Muslim Brotherhood says three pro-Morsi protesters were shot and killed in Cairo earlier today, NPR producer Greg Dixon reports. He adds that it's unclear who fired the shots, though the Brotherhood claims the firing came from government troops. The brother of a wounded protester tells NPR that live ammunition has been fired at some of Morsi's supporters, says producer Greg Dixon, who is in Cairo. It is not clear who fired, Greg adds. "Live fire at [Muslim Brotherhood] demo at officers club as crowd push forward. Casualties," tweets the BBC's Jeremy Bowen, from the scene. "There are reports of Morsi supporters gathering in several locations across the Egyptian capital," the Guardian says. Click here to go back to the top of this post. "The army chief came to President Mohammed Morsi with a simple demand: Step down on your own and don't resist a military ultimatum or the demands of the giant crowds in the streets of Egypt. 'Over my dead body!' Morsi replied to Gen. Abdel Fattah al-Sisi on Monday, two days before the army eventually ousted the Islamist leader after a year in office. "In the end, Egypt's first freely elected president found himself isolated, with allies abandoning him and no one in the army or police willing to support him." -- "For Islamists, Dire Lessons On Politics And Power." The New York Times writes that "from Benghazi to Abu Dhabi, Islamists are drawing lessons from Mr. Morsi's ouster that could shape political Islam for a generation. For some, it demonstrated the futility of democracy in a world dominated by Western powers and their client states. But others, acknowledging that the coup accompanied a broad popular backlash, also faulted the leaders of the Muslim Brotherhood for reaching too fast for so many levers of power." -- "Economic Instability To Cause Further Problems In Egypt." Morning Edition host Renee Montagne talked with Farah Halime, an economic journalist and blogger based in Cairo about the prospects for Egypt's economy now that Morsi has been ousted. -- "Who's Who In The Egyptian Crisis." The Parallels blog offers a guide to the key players.